I was looking for something new to try with my summer tomato abundance & this was a winner! Entered into SP for the nutritionals & thought I would share. ;-) A very slight variation of Wolfgang Puck, 2004 recipe. Bring a large pot of water to a boil and prepare an ice water bath. Cut a small "x" on the bottom of each tomato. In batches, place the tomatoes in the boiling water and blanch them for about 30 seconds to 1 minute, or until the skins are easy to peel away. Remove and immediately plunge into the ice bath. Peel the tomatoes and halve horizontally. Squeeze out the seeds, using your fingers to get them all. Roughly chop the peeled and seeded tomatoes. Set aside. (You can also use whole peeled canned tomatoes. Simply drain them, seed, and roughly chop). Heat a large saute pan over medium high heat. Add the olive oil and heat. When the oil is hot, add the onions and garlic and saute for 2 minutes. Add the thyme leaves, oregano sprig, and chili flakes and saute until the garlic begins to turn golden brown. Add the tomatoes and the sugar and stir well. Lower the heat and cook slowly until the mixture is fairly dry, about 15-25 minutes. Cook the angel hair pasta in boiling, salted water until al dente. Drain the pasta and add it to the sauce. Add the 1/4 cup Parmesan and basil and toss well. 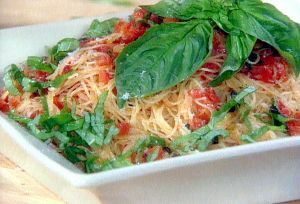 Place in a large pasta bowl and garnish with Parmesan and basil sprigs. Recipe submitted by SparkPeople user JOANN562.